Today sees a new member join our team at The Stamp Man and I am so pleased it is my good blogging buddy Angela from Pages by The Sea. I am going to have to really be on my toes now as she creates the most stunning pieces of art, do pop over and take a look at her work. My inspiration was drawn from the challenges at Studio L3 where the amazing Linda has found another of the fabulous Tim's techniques which is like an embossing batik; Simon Says Stamp and Show where we are challenged to use distress/torn paper, and The Cheerful Stamp Pad to use things with wings. 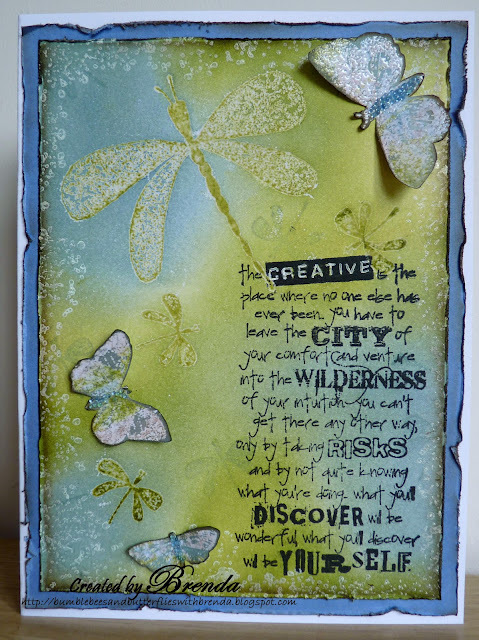 I used Tim's tutorial to stamp the dragonflies and embossed them, then added ink all over the card. The stamped dragonflies were then ironed to remove the embossing powder. I shadow stamped some small dragonflies over the card. The butterflies were created using the same technique and I cut them out and inked over them, leaving the EP on them, small micro beads were added to the body. My sentiment was stamped with black soot DI and I used one of Tim's speckled stamps and used paint to go around the edges; they were also distressed with a distressing tool and inked over. The mount paper edges were distressed and torn. Have a good day and I hope to see you over at the Stamp Man challenge blog. Do go over and take a look at the fabulous inspiration from my fabulous teamies, wow, they are really gorgeous projects. WOWZERS Brenda - this is truly stunning! I love the colours and the whole design of it! Beautiful card Brenda! I used that ironing technique once...then forgot all about it. Works wonders for the dragonflies. Hope you get some sun for the weekend. Our outlook looks good, plus I'll be able to relax and enjoy it! Ooooh this is totally scrummy, love the technique. Fantastic colors. I really enjoyed your card. All the elements work so well together. wow Brenda, what a beautiful and stylish card....love it!....have a wonderful weekend! Gorgeous card! love the colours. WOWSERS Brenda this is a beautiful piece of work, the colours are gorgeous, the technique stunning and the sentiment is devine. One of my all time favourites of yours. Such a beautiful card. You did fabulously combining these challenges. Love the distressed elements and that dragonfly. Thanks for sharing your art in the Cheerful Stamp Pad challenge. What a pretty piece this is!! Love the colors in it and the pretty dragonflies and butterflies!!! an unadulterated BEAUTY....the colors...the techniques...THE WHOLE DANG THING GIRL!!! Thank BUNCHES for playing along with the teamies and Simon Says Stamp and Show!!! A wonderful dragonfly and butterfly work, love the background and the images. Oh WOW this is gorgeous Brenda.